I was sent a copy of Backyard Sports: Sandlot Sluggers to try out and review. I was really excited because we've been pretty happy with all of the Wii games we've purchased... and this was a game I thought we could enjoy playing with Zoe. I read the instruction book before we started trying to play and I have to say it had me a little nervous. There are little charts that tell you all of the different possible controls for batting and pitching and fielding. And me? I am so not good at games that require me to multitask. It's definitely going to take me some time to figure out how to bat and steal bases at the same time. That said... once I put down the book and just tried playing it was really fun (not that I actually won a game or anything). For right now I do wish there was a little more on screen direction about how to bat and pitch. 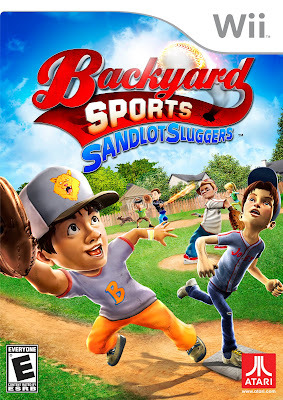 The e-mail I received about the game told me that "Backyard Sports: Sandlot Sluggers offers hours of entertainment with laugh out loud comedic commentary and exaggerated animations for a one-of-a-kind gaming experience. The game is packed with loads of surprises to keep kids coming back for more and stars a neighborhood full of fun and diverse kids – both fan favorite characters and new friends. New features like Power-ups, Mini Games, and Family Co-op allow for a fun-filled experience for the whole family—young and old!" That description is TOTALLY accurate. The animation is really cute... so it had Zoe interested right away. When we played in story mode she was especially happy to design her main player. (Of course... her team wears everything pink... right down to the pink baseball mitt!) Zoe has no clue about all the rules of baseball. She had a really good time pitching and hitting. I think her little kid attitude was quite helpful since she was a much better hitter than I was right off the bat. She also had fun pitching since she wasn't concerned about the strike zone or figuring out how to throw a curve ball versus a knuckle-ball. That said... once someone hit her pitch she had no idea how to get the fielders to throw the ball to a base. Thankfully... she also had little idea about who was scoring and whether or not she was winning. So... she had fun. She's been asking to play the game again all day. It really is a game that anyone can play. There are settings to make it easier to play (for beginners like me) or more difficult (which I'm sure is where my brother's skill level would be). You can use the different controls to do a "power swing" or you can just swing. You can steal bases (or not). You can set it so you have to do the fielding or you can have "auto fielding" set on. The "family co-op mode" allows the 2nd player controller to give a "boost" to player 1's running to help out younger players (or players like me). There is also a "mini games" section that you can play to just practice your skills. The game has a lot of different options. - A really diverse group of kid characters. In our house we were especially happy to see the teams run by girls. - You have the option of playing a mini-game, a single ball game, a whole season. It makes it possible for any attention span to enjoy it. - Being able to change the skill levels can make it possible for even a game player like Zoe (and me) to win. - A fun family friendly game. - I think to REALLY play you have to take a lot of time to practice and learn all of the controls. -There are a lot of control possibilities. It was a little overwhelming. I was sent 1 extra copy of Backyard Sports: Sandlot Sluggers to give away to a reader. I'm going to make this as easy as possible for you... and maybe get some good suggestions in the process! In order to enter all you need to do is comment on this post and tell me your very favorite Wii game. Easy, right? So... enter a comment and tell me... what's your favorite Wii game? I'll use random.org to choose a winning comment. Make sure you enter your e-mail in the comment form sign in so I'll have a way to contact you if you win. The giveaway will end at midnight on Sunday, June 20th, 2010 (Father's Day). Random.org will choose the number of the winning comment. I will notify the winner by e-mail on Monday, June 21st.